Stand Tall is a new rock/pop musical which is loosely based on the story of David & Goliath from the Bible, without the sling but with an electric guitar. It has 17 songs ranging from rock to hip-hop and blues and is running at the Landor Theatre from Wednesday October 12th - Saturday 12th November. David is a shepherd by day and rock star by night. His life becomes complicated when he is proclaimed to be The Chosen One by the mystical Black Sheep and is given the honour of becoming King … but he’s not sure as it could get in the way of his music! Goliath is a bully with a gang of hoods causing mayhem and chaos across town. He’s very angry that David is to become his King and sets out to harm him. 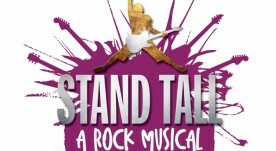 An early version of Stand Tall - A Rock Musical was written specifically for schools to help tackle the issue of bullying. The cast includes Jack Shalloo, Ryan O'Donnell, Keisha Amponsa Banson, Natasha J Barnes and Martin Pirong. The production is directed by Simon Greiff whoe previous credits include the premiere of “The Pork Crunch” (Pleasance), “Spring Awakening” (Wilde Theatre), the British premiere of “Striking 12” (Waterloo East), “Home: The Scott Alan Song Cycle” workshop (Her Majesty’s) which he also co-created. He was the resident director on the No1 tour of “We Will Rock You” and is currently creating “Stories From The Lighthouse” with the award-winning British musical writer Laurence Mark Wythe, whose musical “Tomorrow Morning” was produced at the Landor earlier this year. I went to see Stand Tall this week. I had so many fab things about this show - and I was not dissappointed! Fringe theatre at it's best showing the raw edge of brilliance that is so often ironed out thus creating an 'empty' experience based on bright lights and pretty costume! Creative genre of music all profoundly exhilarating. Excellent writing from one so young. I would love to see go big. This show is awesome. It has an appealing raw, familiar, edgy, want more feeling about it. This can be enjoyed by people from all walks of life because it has something for everyone - and this does not mean mediocre - it means that the writer (surprisingly young) as maturity beyond his years. Listen the music afterwards if you can because it really does stay with you this one (in a good way). Must must see! Catch while it is still small and perfectly formed - this is such a fab show! Wow! I went to opening night on Wednesday and then again yesterday. This show is amazing. The cast are of a very high quality and the script and music are special. This could and should make it to the big stage. You truly do not want to miss this whilst its at the excellent Landor Theatre.